Hope's Cafe: SGSG-Gunther Gifts Review!! Gunther Gifts is a great place to find personalized and engraved gifts for all occasions! "We pride ourselves on serving you in all your gift-giving and engraving needs. Personalized gifts hold a special meaning to the recipient. It demonstrates that you went the extra mile to select a unique gift that shows you care. Special occasions and milestones memorialized in a personalized gift are cherished and last a lifetime. Birthdays, weddings, anniversaries, births, graduations, new jobs, promotions, corporate gifts, client and employee appreciation, safety awards, holidays, new car, new home, religious events, are just a few ideas in which a personalized gift is appropriate and appreciated." I was sent a few products from Gunther Gifts to review, and let me tell you, I am very impressed with the quality and selection! The clip works great to hold a single bill, or a stack. Very nice gift, and I recommend you check out the selection of personalized money clips if you're looking for a unique gift for the man in your life. The Gerber Crucial Tool looks like a snazzy knife, but it's more than a knife...it has wire cutters, flat and philips head screwdrivers, carabiner, and pliers! And the knife blade is half fine edge, half serrated, so even the knife is multi-use! This comes in handy on many occasions, and I love having it in my purse or clipped to my belt loop. They sent me a Swiss Army Knife, the 53001 Swiss Army Knife Classic. I am totally in love with Swiss Army Knives! This little pocketknife has a key ring, small blade, scissors, nail file, tweezers, toothpick and screwdriver, all in one handy little package! This knife goes with me just about everywhere! 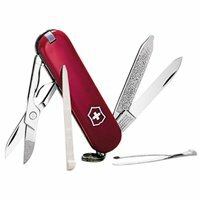 SwissKnivesExpress also offers free engraving on many of their knife models, and free shipping on all orders over $5.00! So, if you're needing some gifts for those hard-to-shop-for people, why not head over and check out Gunther Gifts? There's something for everyone! Disclaimer:I was not monetarily compensated in any way for this review. I did receive product for the purpose of review. All thoughts and opinions are mine. All quotes taken from the Gunther Gifts website. The best gift to women-hermes handbags.